Magnesium is one of the most abundant minerals in the human body and is used in over 300 different physiological processes. Unfortunately, magnesium is also one of the most pervasive deficiencies in our society today. Could the lack of magnesium be influencing your health negatively? This article breaks down the signs of a magnesium deficiency and the best ways to get more in your diet. 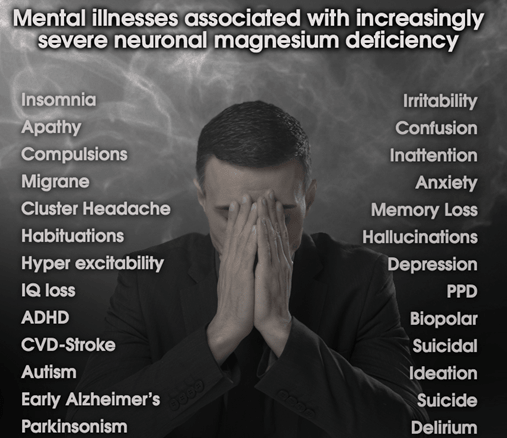 According to American neurosurgeon Norman Shealy, MD, PhD, almost every known disease is associated with a magnesium deficiency. This may sound like a bold statement at first but it actually makes a lot of sense considering the number of roles it plays in the body. This also explains why there are such a diverse set of symptoms that occur when you are not getting enough of it. There are 10 major signs that clue me in as to whether or not someone has a magnesium deficiency. If you are dealing with frequent bouts of brain fog, poor concentration, or constant memory issues, you may have a magnesium deficiency. Structures within every cell of the body, called mitochondria, are responsible for producing the energy that the body uses for everything. The brain contains the highest concentration of mitochondria in the male body (females have a higher concentration in their ovaries). Mitochondria are heavily reliant on magnesium for energy production so a deficiency can hamper your brain performance significantly. It comes at no surprise that supplemental magnesium has been shown to improve learning and memory! It has been found that sufferers of chronic migraines often have lower levels of magnesium in their bodies. 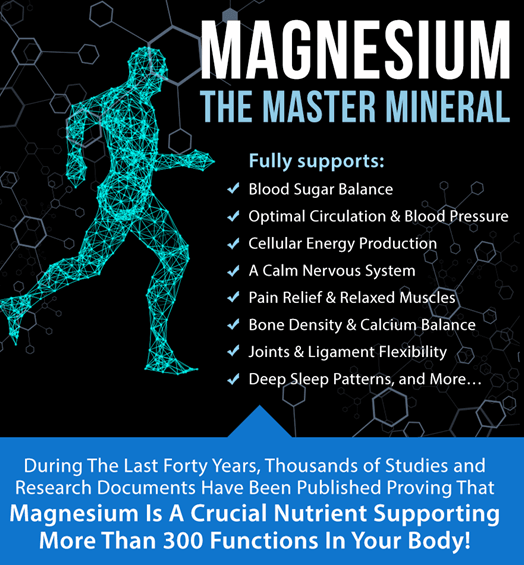 Considering how important magnesium is for proper nerve function, this makes a lot of sense. Magnesium also plays the additional key role of regulating neurotransmitter production, which can also influence migraines. Supplemental magnesium taken on a regular basis has been shown to decrease both the frequency and intensity of migraine headaches. Additionally, magnesium has been shown to have the same effect on non-migraine headaches as well. 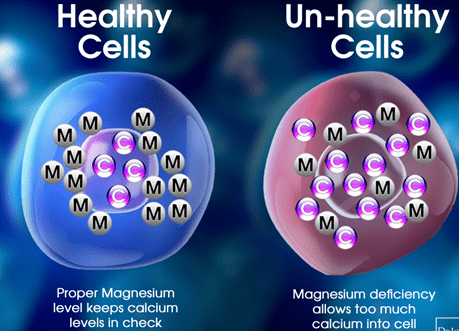 Much of this has to do with magnesium’s ability to help regulate calcium balance within neuronal cells. Too much calcium can lead to exitotoxic effects where the brain cells are overstimulated and this is a major factor in headaches and migraine formation. Constipation is one digestive issue I hear all the time. Proper magnesium intake actually softens stools by drawing water into the bowels, supporting healthy elimination. If stools become too hard, they move slower through the colon and become a problem. This is why I always recommend magnesium when I hear this complaint. 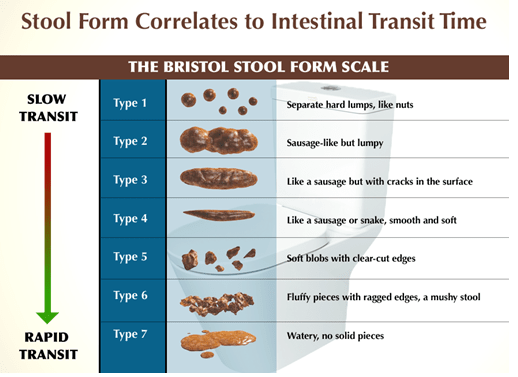 For reference, an ideal stool should resemble type 3 or 4 on the Bristol stool chart below. 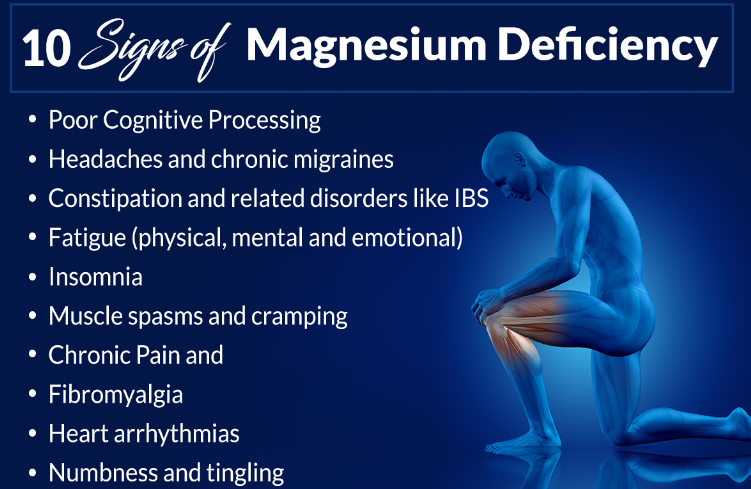 Additionally, magnesium plays a major role in regulating muscle contractions in the intestines and this is why a magnesium deficiency often results in constipation. In this way, magnesium can also be a very helpful in relieving discomfort and cramping due to IBS or other similar conditions. Magnesium is highly involved with energy production. As mentioned before, the mitochondria in your cells heavily rely on magnesium to produce energy (4). 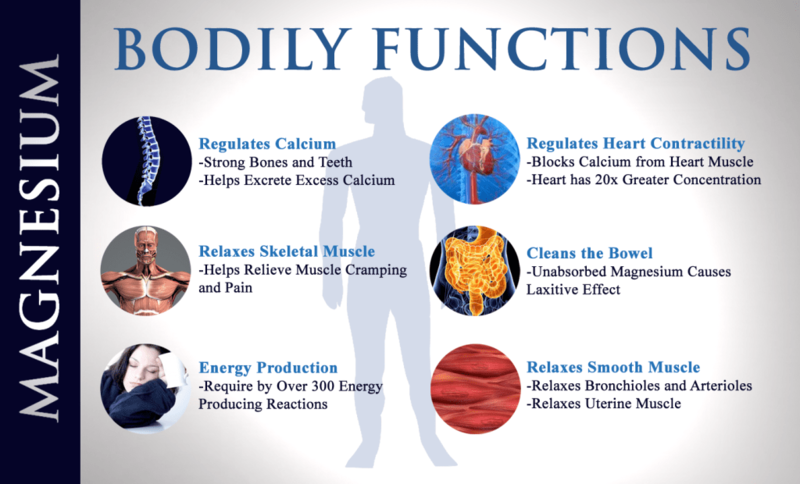 Your mitochondrial function primarily determines your energy levels. Additionally, magnesium supports the adrenal glands which can play a huge part in energy production as well. And the kicker… because magnesium is involved in so many enzymatic processes in the body, deficiency will make it harder to perform over 300 normal processes. This acts as a chronic stressor on your body and drains your energy! If you are chronically fatigued, you may have a magnesium deficiency and increasing your magnesium intake can improve your energy levels drastically. Insomnia is one of the big conditions I see a lot of improvement in when beginning magnesium supplementation. This is because magnesium is involved in the production of GABA in the brain. GABA is what is known as an inhibitory neurotransmitter. This just means a chemical that promotes relaxation. If you don’t have enough magnesium to produce adequate amounts of GABA, your sleep will likely suffer. Although there are other nutrients involved with GABA production, magnesium is a critical factor that will heavily determine your sleep quality. 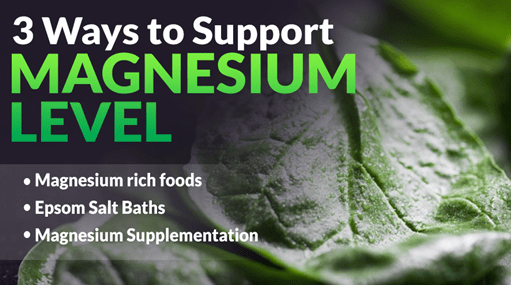 Because magnesium is so important for proper nerve transmission, it comes as no surprise that it also plays a vital role in muscle contraction. When magnesium is depleted, muscle contractions can become weak and uncoordinated, leading to involuntary spasms and painful cramps. This is actually one of the most common early signs of magnesium deficiency. Spasms typically occur in the legs, feet, and sometimes even in places like the eyelids. If you are a woman, you may also experience worsened PMS-related cramping when magnesium stores are low. 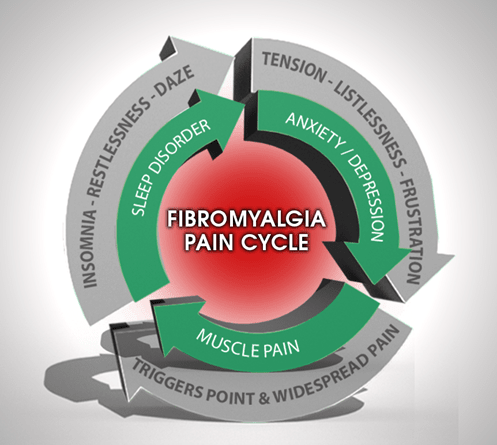 Chronic pain and related conditions like fibromyalgia are heavily related to tension carried in the body. 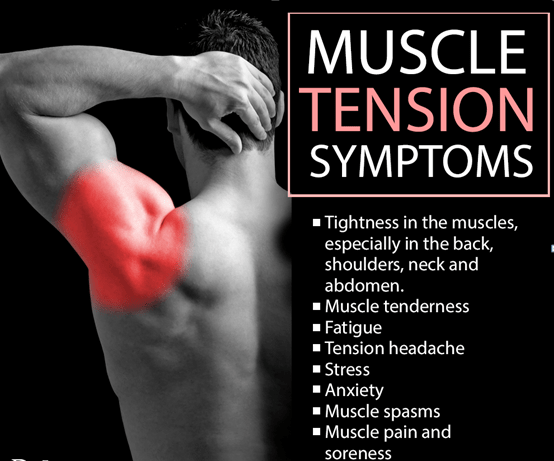 This tension can be purely physical, but can also be aggravated by emotional stress as well. Emotions such as anxiety, anger, and worry all contribute to physical tension. Over time this chronic tension leads to pain. When magnesium stores are low in the body, the nervous system can become hyper excitable (meaning easily overstimulated) which can increase muscle tension. Magnesium can play a role here by helping to elicit an overall calming effect on the mind and body while soothing and relaxing the muscles. The heart is a muscle that constantly contracts inside our bodies without needing to be consciously controlled. Just as with other muscles in the body, the heart relies heavily on magnesium for proper contractility. This is thought to be due to its role in regulating calcium and potassium concentrations in the muscle tissue. If you notice that your heart beats irregularly, magnesium may be something to address. This includes rapid heartbeats, slow heartbeats, and sudden changes in heart rhythm for no apparent reason. If you often feel numbness or tingling sensations in your body, such as in the hands and feet, this is likely due to a change in nerve activity. For example, peripheral neuropathy (a common side effect of diabetes) is characterized by these sensations. Because of its role in healthy nerve transmission, magnesium deficiency may be at least in part playing a role here. 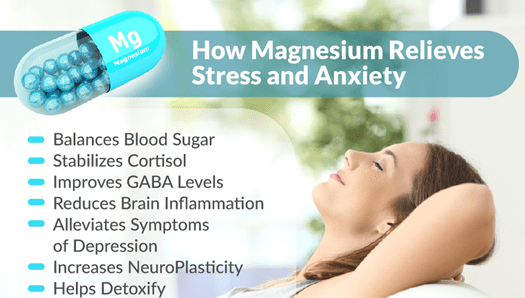 Limited research has been performed on this mechanism specifically, but some studies have shown that magnesium may be able to relieve or prevent numbness and tingling in the extremities. This effect has been highlighted in research showing protective properties against peripheral neuropathy induced by certain cancer therapies. Magnesium plays a crucial role in regulating neurotransmitter balance. Neurotransmitters are chemicals in the brain that regulate thought patterns and behaviors ranging from motivation to sleep to focus (and many more). As mentioned before, magnesium is particularly involved in GABA production in the brain, which is a calming neurotransmitter. A poor ability to produce adequate GABA in the brain results in conditions such as ADD/ADHD, anxiety, irritability, and general mood imbalances. If you identify with these feelings on a regular basis, you should consider increasing your daily magnesium intake. 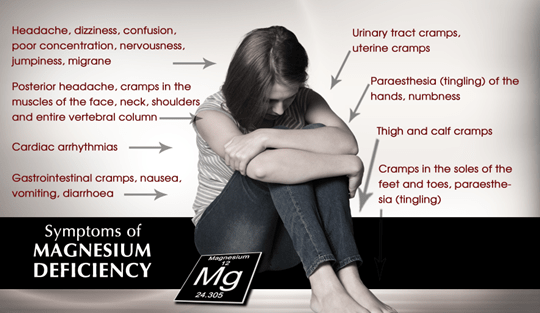 Now that you know the signs of magnesium deficiency and just how important this mineral is for the human body, it is important to understand the best ways to obtain it. Follow these 3 strategies to boost your magnesium levels and do your health a tremendous favor. As with most nutrients, I always recommend starting with your diet. There are plenty of great food sources of magnesium that are easy to incorporate into your daily life. Some of my favorites are avocados, leafy green vegetables and salmon, even raw chocolate in small quantities. 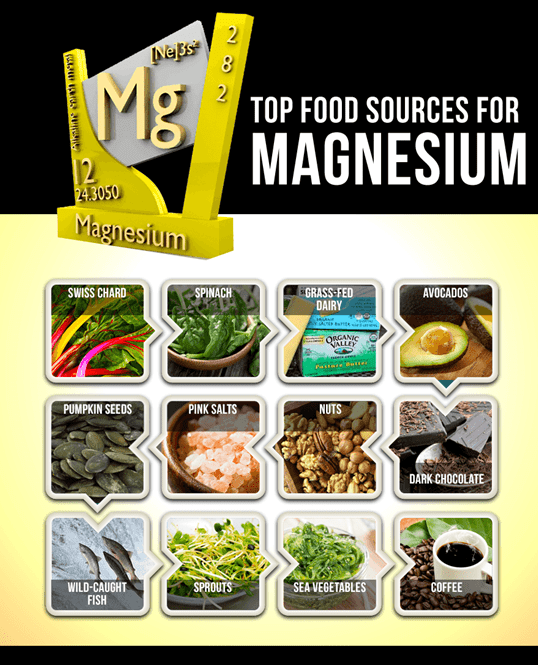 I’d recommend picking a few high-magnesium foods and consuming them on a regular basis. For example, I use avocados to make avocado chocolate protein pudding that I eat for lunch just about every day! Perhaps one of the most relaxing ways to get more magnesium into your body is by taking an Epsom salt bath. Epsom salts are actually a form of magnesium that can absorb into the body through the skin while you soak. This is part of the reason why Epsom salt baths are so relaxing! While traditional Epsom salts are made of magnesium sulfate, there are also newer forms of magnesium flakes that are made of magnesium chloride. Both types of salts provide benefits for the body, however magnesium chloride may be able to provide longer lasting benefits. This is because magnesium chloride is both easier to absorb and slower to be excreted from the body. This means that less magnesium chloride is needed to derive benefits. This being said, I really prefer Alkabath salts that are more detoxifying and not acidic like Epsom Salts are. 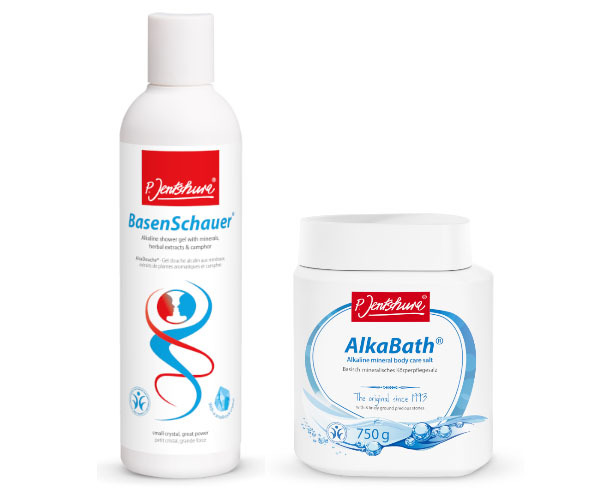 If you’d like to learn more about the Alkabath salts please stop by or call 905-715-6443 for additional information. When it comes down to it, our food supply just isn’t what it used to be. Industrialization and poor attention to soil quality has depleted our soil of vital nutrients that used to be passed into the food we ate. Although we are starting to wake up to this fact and make more conscious efforts to create nourished farming conditions, our food is still lacking in the nutrition our bodies need. This is why I recommend supplemental magnesium to so many of my patients. It is just so critically important to make sure you get enough magnesium in your diet that even I supplement with it every day. 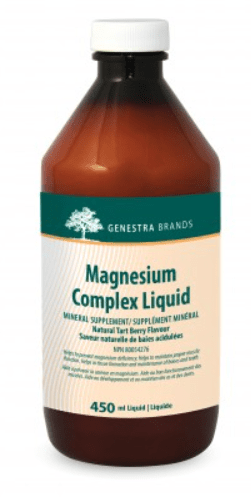 My favorite product to supplement magnesium is by Genestra in liquid form for quick absorption. You can call me to purchase this product if you like. By now you understand how important magnesium is for the human body. Even if you do not have any of the common symptoms of magnesium deficiency listed above, just about anyone can benefit from additional magnesium in the diet. I use magnesium every day as I find that it helps keep my mind at ease and my energy levels balanced. It also has the cool effect of acting as an adaptogen by improving your body’s ability to adapt to everyday stressors. It truly is a modern-day health tonic!